We all have heard stories from our friends, how they came here on a golf trip, or their parents moved here, a military deployment perhaps. Tourism, retirement and the military have all been an important part of our growth. What about the rest of the people who can help the county grow the way we want it to and would love to live in our idyllic county? People who want to start businesses, move businesses or find a place they can make dynamic contributions of all kinds are welcome here, but we need them to be able to find us. We are asking local businesses to put the Moore Alive logo prominently on their web site and link it to Moore Alive so customers and visitors to their site can learn more about Moore County. Especially useful to Moore County realtors, and Moore County builders, who helped fund the initiative, any business or entity will benefit from the regional branding that supplements their own efforts. It saves businesses money because they do not have to put resources into maintaining website pages and keeping information current. It is an exciting time to be part of this growing marketing strategy. Regional branding is a new and dynamic trend in economic development. Telling the stories of our area through the web site makes it personal and gives the human connection so that it is more than a place on a map. 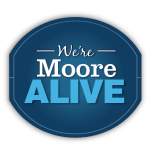 Please get in touch if you have any questions about the 'We're Moore Alive' initiative!